COP I-SH LEVEL I-MID RIDE [COP I -SH] - $108.03 : Don Hume Leathergoods, Simply the Best! The "COP I -SH" holsters are suede lined, and have a metal reinforced belt loop with locking screw, bent to contour with the hip. Other features are the tension screw on body, covered trigger guard with a reinforced overlay to keep the mouth open for easy reholstering, open bottom, reinforced thumb break, and nylon sight tunnel. 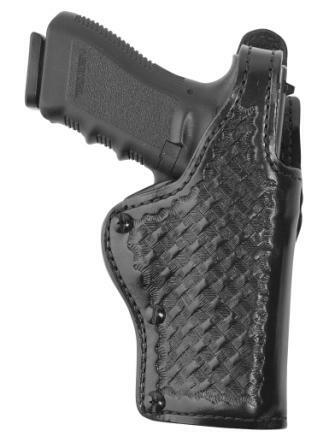 A polyethylene layer adds extra strength and rigidity to this durable holster.